So I'm at it again - trying to make three different "fermentable beverages" in a single day. This is how to wisely spend a vacation day, I tell you! 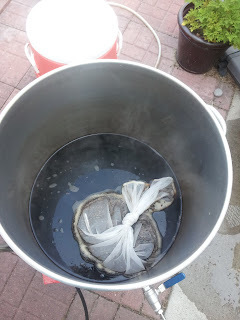 Today is running a little different than last time, though, partially because I had to stay outside the whole time, so I couldn't use the stove for a mash water heater which delayed my ability to get the extract brew on. So - what's in the lineup for today? 1- Kolsch - I won about 10 lbs of pilsner malt in a raffle so what do I do with that? Make a nice easy-drinking kolsch for Oktoberfest time! It is a 10 gallon all-grain batch with a simple grain bill. 2- Porter (plus something extra) - have been wondering for a while if there is a way to incorporate bacon into beer. Found a recipe and a commercial example, so I am guessing the answer is yes. So, here goes - Porker Porter - five gallon extract batch (grains steeping above in picture), bacon (cooked and dried of as much grease as possible) added to the secondary. 3 - Cyser - I was pleasantly surprised with my cider creation last time - so decided to spice it up a bit. Making a cyser with honey, white raisins, apple cider, and cinnamon. Sounds like a fall or winter treat. I will probably try to bottle it in November, I think - maybe earlier - and enjoy some young this fall, to see how it goes. I'll save some for next year, perhaps. Now, here's the tricky part (to be figured out next week some time). I only have 4 carboys. I am using all 4. I want all three with beer in them (porter and two with kolsch) to be secondary fermented. Where I sit right now is either racking one to a sanitized bottling bucket, then holding while I clean and rack the other 2 carboys then return the bottle batch to a clean and sanitized carboy, OR saying forget it, bottling one of the batches of Kolsch, and daisy-chaining from there. I do think the Kolsch would benefit clarity-wise from a secondary rest, though. We will see (and by that I mean we will see how lazy I am). I also need to get some bottles cleared out to hold all this beer! Will post recipes shortly. Enjoy! 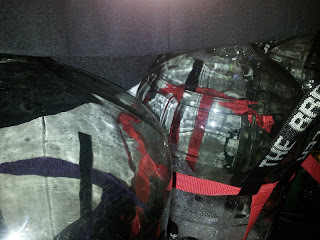 Bottled up the cider Sunday, half sweetened/half dry, which leaves me with only one empty case of bottles, but another problem - four empty carboys. I am not sure I'm going to pull off another 20 gallon brew day again, but I could very well pull off 15. We will see how it goes. For now, though, I just have to figure out WHAT to brew. Probably something that can sit in a carboy a while as I clear out more bottles (time to get to work on that, eh? ), so maybe something that has to age, alongside some drinkable beer that I can bottle up when it is ready. I'll go back to my planning board, while you all wait with bated breath. In the meantime, what are you brewing?